Conservative leaked memos show 2015 will be a full-fledged assault on the Liberal Party – just as the past 3 elections were. The Conservative strategy is to use Harper’s wife and undermine Liberal Leader Justin Trudeau by reigniting old divisions in the party and giving a microphone to internal critics to policy stances the party has taken. The assault would begin at the Liberal Party’s Montreal Convention set to begin next Thursday while Liberal members choose the policies they want to see in the 2015 platform and the executive team they want to guide their electoral readiness. “Canadians will face a clear choice in the next election between Justin Trudeau’s poor judgement, lack of experience and bad plan on the economy and Prime Minister Harper’s strong, stable leadership and low tax plan for jobs and economic growth for Canadian families,” Conservative executive director Dimitri Soudas said. It turns out that the strong, stable Conservative Party has lost a considerable amount of its steam. From policy differences among social conservatives to a year-long spotlight on a massive PMO scandal to a major contradiction on what was supposed to be a 2011/2015 election promise. The united coalition of the former Progressive Conservative and Canadian Alliance parties is showing its expanding fault lines as moderates within the party track to Trudeau’s Liberals and Reformers in the party’s establishment mull the censorship they had to endure to remain electable. 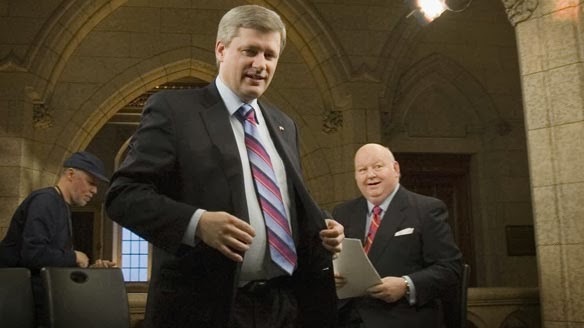 In 2011, the Conservatives promised that if they got a surplus they would implement an income splitting program to equalize salaries between spouses with children below the age of 18 in an effort to lower their family’s tax burden. Next year’s budget is expected to be balanced, but don’t expect the Conservatives to keep their promise. Prime Minister Stephen Harper may have toured the country in the last election on that promise, but blatant contradictions and counter-arguments from Finance Minister Jim Flaherty has shown yet another fault line expanding in the Conservative Party. The tear has left other Conservative MPs in caucus confused and refusing to answer. Damned if they do and damned if they don’t, income splitting will either be the issue that demonstrates they’ve broken their promise or it will be the issue that shows how reckless the Conservative Party can be. How good can a policy really be when their own finance minister has shot it down publicly? So much for steady the course – the likely Conservative election theme. 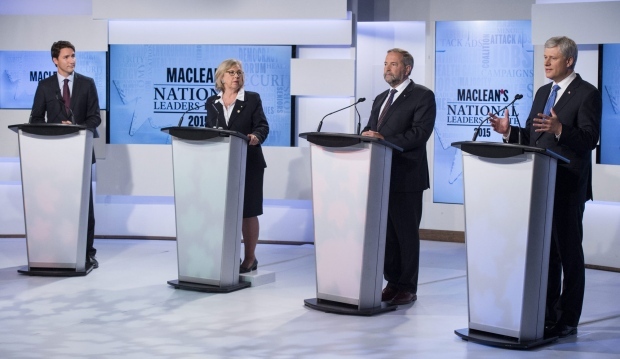 Harper’s message remains clear: income splitting is happening. “Once we get a balanced budget and once we get a surplus we can have obviously the discussion about what we do next,” Harper told reporters Thursday. Contrast this to Flaherty’s announcement on Wednesday and the opposition gets thrown a bone. “It benefits some parts of the Canadian population a lot. And other parts of the Canadian population virtually not at all,” Flaherty said. Liberal leader Justin Trudeau used this ounce of division to drive a wedge into the Conservatives’ ability to govern. “The way that I’m building the platform for the Liberal party over the coming year-and-a-half, we’re very much thinking about how we implement (policies) and not just whether or not they’re saleable politically,” Trudeau said, adding that the Conservatives may want to focus on their own internal disarray and division. 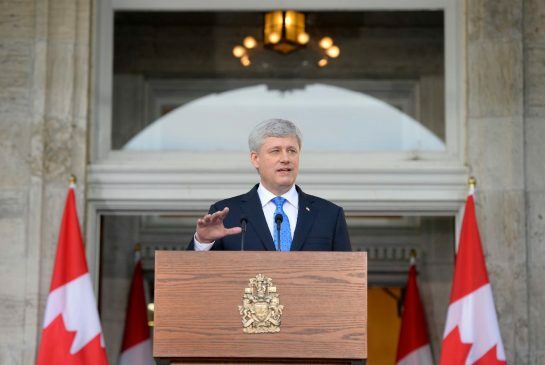 The income splitting promise may be the least of Harper’s worries in 2015. With a party showing deepening division and a resonating Liberal leader and a united Liberal Party, the Conservatives face the fate they exploited to get into power: division. A divided Liberal Party in disarray was easy for Harper to fight against, however, in 2015, he will now be facing a united Liberal front with a very influential leader while standing on a shaky (at best) foundation. What do you think of the recent turn of events in Conservative unity and election strategy? Conservative strategy is to use Prime Minister Stephen Harper's wife and undermine Liberal Leader Justin Trudeau by reigniting old divisions in the party and giving a microphone to internal critics to policy stances the party has taken. 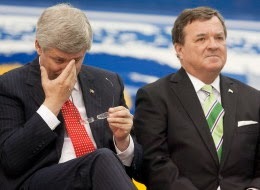 Stephen Harper and his Finance Minister Jim Flaherty sit on opposite sides of the Income Splitting debate.